Location for items not included in other categories. Like Accordion functions, festivals, workshops, conventions, etc. The largest motivation I have for doing all this – is that there are NOT ENOUGH ACCORDION TEACHERS out there these days – and those that do teach – are hurting for new and modern materials to use. AND here in the USA – there is NO Certification process – for future accordionists OR teachers and no accordion organizations that offers it. These sessions will be recorded so you can catch it at another time – or use it for review. AND see that even though I am starting VERY LOW – I will have challenges for the advance beginner, the intermediate player and the teachers! Until now, I have not featured a lyricist and a compilation of the songs they contributed lyrics too – but Jack Yellen is an American composer, screenwriter and lyricists for Broadway and 20th Century Fox in the early 20th century. 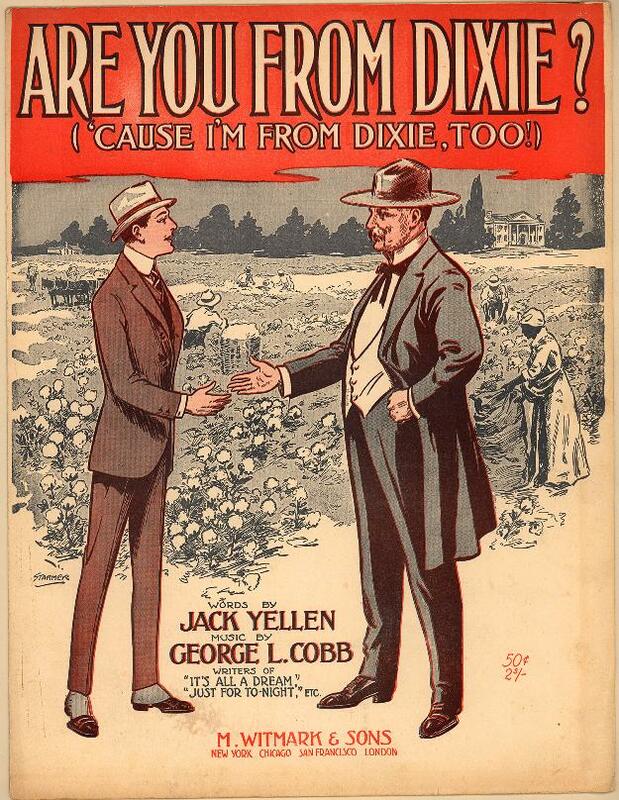 I attached the original sheet music for Are You From Dixie – so you can see the COOL LOOKING SHEET MUSIC! and so you can see what I worked from to write the arrangement. I haven’t found these – but this is a partial list of more of his songs! In 1897, the Yellen family immigrated to the US. After graduating from the University of Michigan, Jack found work as a report for the Buffalo Courier. He soon moved to New York to become a songwriter and wrote special material for singers including Sophie Tucker. Yellen collaborated with many composers including Milton Ager, Abe Olman, Harold Arlen, Sammy Fain, Ray Henderson, Joe Meyer, Lew Pollack and Samuel Pokrass. Throughout his career, he wrote scores for several Broadway productions including What’s in a Name, Rain or Shine, John Murray Anderson’s Almanac, You Said It, George White’s Scandals of 1935 and 1939, Boys and Girls Together, Sons o’ Fun, Ziegfeld Follies of 1943. Yellen moved to Hollywood under contract to film studios and became a screenwriter and lyricists for 20th Century Fox. His filmography includes score credits for Road Show, The King of Jazz, George White’s Scandals (1934, 1935), Happy Landing, King of Burlesque, Captain January and Sing, Baby Sing, Rebecca of Sunnybrook Farm.